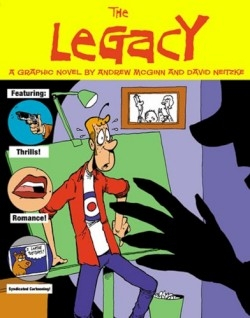 The basic premise of The Legacy is deceptively simple: Chas Brown, a struggling graphic novelist, is the heir apparent to Simple Pleasures, the single most popular comic strip in the world. There’s only one small problem. Chas hates what comic strips have become, and has no intention of following in his father’s footsteps. Then, after putting off revealing the terrible truth for years, Chas is prompted by his dad’s sudden passing to make a spur-of-the-moment vow to continue the strip in accordance with his father’s wishes. This soon leads to a major crisis for the fledgling cartoonist after he discovers that he’s wholly unwilling to create wholesome and whimsical work for the entertainment of the masses. Finding himself backed into a corner, Chas decides to do the only “logical” thing, and do his best to get the strip cancelled. And that’s when things get really interestingÂ…and very, very funny. Andrew McGinn’s script is a finely tuned machine, fueled by equal parts broad humor and sharp-toothed social commentary. Peppered throughout with realistic adult language and situations, every scene of The Legacy reveals a deeply considered understanding of the dynamics underlying familial, generational, and professional relationships, as well as a keen and steady grasp of how easily conflicts can arise between, and within, individuals. David Neitzke’s line work is the perfect complement to McGinn’s wordplay. Supple, lanky, and yet wholly controlled, his cartoony rendering, choice of shots, and use of negative space is spot-on in every panel. Neitzke also proves to be a master at imbuing his characters with a wide-ranging emotional life, a skill that becomes increasingly important as the consequences of his impetuous decisions become increasingly apparent to Chas later in the script. Driven by his growing awareness that even the smallest of our actions can have far-ranging and unforeseen consequences, Chas Brown finally makes a decision that irrevocably alters his life’s course even as it propels The Legacy towards an ending that is as satisfying as it is inevitable. More importantly, it’s also the moment that marks this character and his story as something worthy of real attention. As with the best books, The Legacy offers casual readers an enjoyable opportunity to escape into another world. But it also offers those wanting something more from their entertainments a glimpse of that rarest of moments-the instant when a callow youth chooses to become a man.